In this tutorial we will show you how to bypass Duet’s internal Mic Pre Amps connect an external Mic Pre Amp. Connect your Microphone to the input of the external mic pre amp. 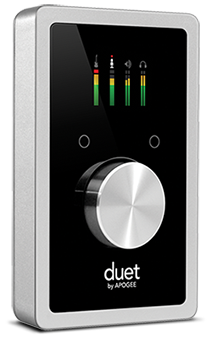 Now connect the output of the Mic Pre Amp to Duet’s XLR input. Do not use the 1/4″ input as it was designed specifically for instruments. In the drop down menu you will see four choices +4, -10, Mic, and Instrument. Now adjust the gain on your external mic pre amp and you’re ready to begin recording.